Royal North Down Shako headdress. The North Down Militia shared a common heritage with its South Down counterpart, both being formed in 1800 when the Royal Downshire Regiment was split into two battalions. 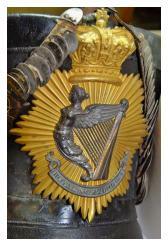 This followed the amalgamation of the 24th Drogheda Battalion with the 5th Louth Regiment. The ‘vacancy’ created on the Militia roll was filled by dividing the twelve-company 8th Royal Downshire Regiment into two six-company battalions: 8th Royal South Down and 24th Royal North Down. The original Down Regiment, or Royal Downshire Regiment, whose Colonel was Lord Downshire, received Colours at Youghal in May 1794. Described as ‘truly superb’, these were paid for by his Lordship and cost £70 10s. 0d. (£70.50). In contrast, Militia regiments in England were allowed £18 10s.0d. (£18.50) every twelve years to pay for Colours. Downshire was determined to make his regiment quite distinctive. As with the other Irish Militia units, the Down Regiment was mobilised as soon as it was formed in 1793 and is recorded as having been embodied ‘almost continuously’ from 31 August 1793 to 10 October 1814 for the Revolutionary and Napoleonic Wars. A further short period of embodiment followed. In the 1798 Rebellion in Leinster the Royal Downshire Regiment fought at Coolbawn and Castlecomer in County Kilkenny on 23 June, followed by Kilconnell Hill three days later. These actions brought the Downshires into battle against rebels led by one of the most famous of rebel leaders, Father John Murphy, whose men had advanced to Goresbridge through the Scullogue Gap in the Blackstairs Mountains on the 22nd. Next day a company from each of the Wexford Militia and the Royal Downshire Militia arrived at Castlecomer to reinforce the troops already present who then moved out to meet the rebels at Gurteen. The resultant clash was a triumph for the rebels and the government troops retreated to Castlecomer where discipline was restored. Two buildings by the bridge were taken over and used as strongpoints. All rebel efforts to advance were rebuffed and, although they demanded the surrender of the Militia, the arrival of substantial reinforcements deprived them of any advantage, forcing a withdrawal towards Wexford. On their retreat the rebels, some 5,000 strong, camped overnight near Goresbridge. Their camp was on Kilconnell Hill, also known as Kilcumney or Kilcomery Hill. Under cover of thick mist early the next morning the camp was attacked by a Militia force of 1,600 men, 1,200 commanded by General Sir Charles Asgill and 400 of the Down Regiment commanded by Major George Matthews. The rebels fled but Asgill refused to co-operate with Matthews in mounting a pincer operation that could have resulted in a clearer victory. Nonetheless, Matthews pursued the rebels for twenty miles towards the Wicklow Mountains. The Downshires marched for 39 hours through three counties, Queen's (Laois), Kilkenny and Carlow, harrying the rebels. A further suggestion from Matthews to Asgill for a co-ordinated operation bore fruit. The resulting fresh attack led to defeat for the rebels; their final defeat had been certain since 21 June and the Battle of Vinegar Hill. Throughout, Major Matthews had shown more initiative than did General Asgill, who seems to have been intimidated by the rebels’ greater numbers. In September 1798 some 300 of the Downshire Regiment operated as part of General Trench’s Column against Humbert’s French invading force in the Killala area where, on the 26th, it was reported that the rebels had lost between 500 and 600 men. The Royal Down Regiment was split into the Royal South Down and Royal North Down Battalions in 1800 and continued on active service until the end of the French Revolutionary War. However, both battalions were recalled to service in 1802, remaining so almost continuously until 1816 and the final defeat of Napoleon. Both units provided recruits for the Regular Army throughout that period but were reduced to cadre strength in March 1816. The loss of pre-1885 records as a result of fire means that accurate dates for the unit’s initial mobilisation are not known. A further mobilisation, for both battalions, began in 1802 and lasted until October 1814 and there was an additional period when they were mobilised from October 1815 to March 1816. Thereafter the North Down Battalion was reduced to cadre strength and remained so until the outbreak of the Crimean War. On the re-organisation of the Militia across the UK in 1833 the unit became the 77th Royal North Down Regiment with headquarters in Newtownards, or Newton Ards as it is described in contemporary records. It thus became senior in the Militia Roll to its South Down counterpart which had earlier been the senior of the pair on the Irish establishment. On 1 September 1837 Viscount Castlereagh was appointed Colonel of the Regiment; Lieutenant Colonel John P Nugent had been appointed to his post a year earlier while William Read was appointed as the Major on 2 November 1836. The longest serving officer in 1850 was Lieutenant William Hickland who had been commissioned on 1 December 1803. Pinkston Blackwood, the Surgeon, had similar service, having been appointed on 16 February 1805. Next in seniority of service were Lieutenants Hans Hendrick (7 May 1810) and Alexander Crozier (19 December 1812) and Ensigns William Henery (11 April 1814) and Henery Mercer (5 April 1815) while the Adjutant, William Howe, had been appointed on 25 August 1815. The Regiment was mobilised for the Crimean War from January 1855 to 13 August 1856 and for the Indian Mutiny from 20 September 1857 to 25 March 1859, after which followed a further reduction to cadre strength. With the implementation of the Childers Reforms in 1881 the Royal North Militia became the 3rd Battalion of the newly-formed Royal Irish Rifles, maintaining its seniority over the South Downs who became the 5th Battalion. On 14 May 1900 the Battalion was mobilised for the Second South African War and a service company of 110 men under Captain W R McD Parr joined the 5th Battalion for service in South Africa. Although the Battalion’s mobilisation ended on 19 October, Captain Parr’s volunteer service company sailed to South Africa with the 5th Battalion. In the course of service there Private Owen was promoted to corporal ‘for going out to be captured by the Boers for the purpose of bringing back information’. Following the Haldane reforms of 1908, and the renaming of the Irish Militia as the Special Reserve, the battalion became 4th (SR) Battalion Royal Irish Rifles with the Antrims taking seniority as the 3rd. In 1914, on the outbreak of the First World War, the 4th (Special Reserve) Battalion assumed the role of recruiting and training drafts, ‘holding’ men unfit for front-line service, holding officers too young for such service and helping guard Ireland against possible invasion. The battalion discharged this duty with professionalism and when the war ended was again reduced to cadre, becoming a title in the Army List which remained until its disappearance in 1953 with the final disbandment of the Militia.